This book is, quite simply (and explained by the subtitle), a guide to wine. The world of wine can be complicated, and this is meant to help newbies to enter it without intimidation. It’s an illustrated how-to separated into six chapters focused on choosing, tasting, pairing, and buying wine, as well as going over the process of making wine and the attributes of vineyards all over the world. I first heard of the book at Beth Fish Reads. The review there is excellent and I highly recommend taking a look at what Candace has to say. For my part, I mostly enjoyed the book, learned a lot, and will simply present in bullets my thoughts from reading. – I appreciate the humor in this book. There’s a lot of snobbery around wine culture. I remember once Jason getting a 365 wine calendar from an oblivious coworker (who didn’t realize that Jason was both under-age and didn’t drink). He would read out the entries to me, laughing at the wine descriptions. There’s a page in here that provides a “shortcut” to talking about wine, and it sounds a lot like that calendar. “Repeat one of these phrases at random and speak them with an air of conviction” the book says, followed by speech bubbles that say things like, “An intense nose. On the palate, it has presence and a muscular, tannic texture.” There are places like this all throughout the book, providing a bit of humor to what can admittedly be a snobby field at times. – The book is very France-centric. There are jabs at why the British have always been poor wine-makers. The states of Colorado, New Mexico, Texas, Missouri, Ohio, and Michigan are collectively referred to as “the Midwest.” There are jabs at the US, too, saying that we prefer sweet wines because of our extensive soda-and-fruit-juice consumption. And though the author admits that Italy is just as wine-centric as France, the French wines are considered obviously better. It’s cheeky in the way it displays all this, though, which made me laugh every time. My only quibble with it is only a quibble because I don’t live in France. Much of the book focuses on the different subtle wines and varieties coming from France, many of which I’d be hard-pressed to find. I would have liked a wider world view of wine, but the book is from France, so I can understand why the French wines took the spotlight. – While the book is meant to be an easy introduction for newbies, I think it would have scared me off completely when I first started drinking wine three years ago. The section on the different kinds of wine (in Chapter Three) and the pairings (Chapter Five) would have been the only parts I’d have paid attention to back then. Back then, having never even heard of most types of wine, I wanted a basic guide to tell me basic things: dry or sweet? what things should I taste? what foods will this work with? etc. If you’re new enough to wine to not know whether or not muscat is sweet, this book might be a bit intimidating. However, after several years of trying many wines, with the help of wine shop employees and a lovely app called Pocket Wine, I now have a general average-drinker’s intelligence of wine, and found much of what was in here to be useful in deepening my knowledge. Plus, it introduced me to wines I’ve never heard of or seen, and I can’t wait to find and try them! – This book, combined with information from Real Food, Fake Food, gave me a lot to think about in terms of bottle labeling. Of course, the labeling information here is related to bottles in France, and the labeling laws are different here. However, there was enough information that I could better understand the French portions of the wines I had tucked away. – I’ve never done a wine tasting (other than those that happen to pop up at grocery stores), been to a wine festival, or visited a winery. These are all things I’d like to do. And now I know a lot more about tasting wine, and what different things mean when I taste it and see it in my glass. I had some basic knowledge before, but I know more now, and yay for knowledge! – Ironically, back in 1999 when I was on a study abroad program in France, I had a chance to do a wine trip across central France. Our group went to several wineries and did tastings, saw the vineyards, and who knows what else. At the time, I was twenty years old and didn’t drink wine, and so declined to go on that trip. Imagine my chagrin now. I also feel sad that the last time I went on a cruise, four years ago, I didn’t take advantage of having a sommelier at dinner every night, because I still wasn’t drinking wine at the time. Sigh. What a waste. I need another cruise. Ha! – I don’t know that I’ll ever be more than a casual wine drinker. Even so, I definitely want a copy of this book (currently have the library’s copy). I love the handy reference and illustrations. I love the ideas for parties and the tasting sheets. 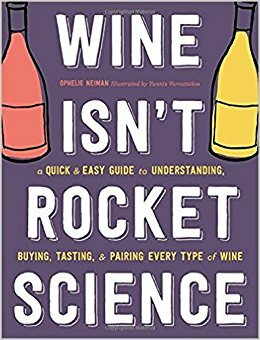 Generally, despite a few flaws, I found the book entertaining and informative, an excellent read for casual wine drinkers, which is the only class of wine drinker I can vouch for. This entry was posted in 2017, Adult, Visual and tagged food, nonfiction. Bookmark the permalink. This books sounds intriguing. I can only imagine what they say about the German wines! Which are cheap and plentiful here. Seriously, I can get a decent bottle at Aldi for about 4 euro. The book didn’t say tons about German wines. Said they were unique and generally good quality, and categorized most of them into a category that isn’t my favorite. But like most non-French wines, there was only a cursory glance at them.